Join trivia host Fr. 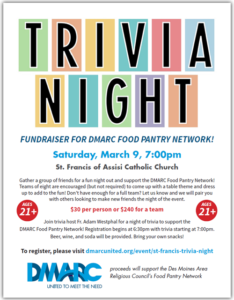 Adam Westphal for a night of trivia to support the DMARC food Pantry Network! Registration begins at 6:30pm with trivia starting at 7:00pm. Beer, wine, and soda will be provided. Bring your own snacks! Gather a group of friends for a fun night out and support the DMARC Food Pantry Network! Teams of eight are encouraged (but not required) to come up with a table theme and dress up to add to the fun! Don’t have enough for a full team? Let us know and we will pair you with others looking to make new friends the night of the event. This event is 21+. Are you part of a team already, or do you need to be paired with teammates? I am already part of a team.I would like to be paired with a team.